Home to the legendary South China tiger, Fujian is covered by steep mountains and dense jungle. It offers great hiking opportunities, as only recently were roads pushed through its mountains. Its quiet inlands are still largely uncharted today. However, Fujian’s mountains are also the site of vast tea fields that are China’s major source of oolong tea. Fujian is famous its 3,300-kilometre coastline. For several hundreds of years its historic ports have been points of entry for travellers in and out of China, a major source of livelihood, providing many opportunities for trading and commerce. The Silk Road to the sea is believed to have begun here. The seafaring and trading Hokkienese are an important ethnic and linguistic community throughout South East Asia, a fact which has considerably strengthened Fujian’s economy. 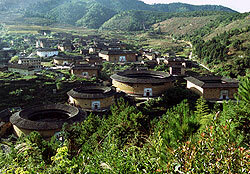 Fujian’s most notable cities are on its coast. Its modern day capital, Fuzhou, is a boomtown, with towering skyscrapers, while the nearby town of Xiamen with its historic port offers a peek into a colourful past. Xiamen was the first European port of trade first used mainly by the Portuguese in 1541, and one of the five Chinese treaty ports opened by the Treaty of Nanjing (signed in 1842) at the end of the First Opium War between Britain and China. As a result, it became an early entry point for Protestant missions. Xiamen was also one of China's earliest Special Economic Zones in the 1980s, which helped give the entire province economic dynamism. Xiamen’s Gulangyu, also known as Piano Island, is a popular, peaceful weekend getaway with pleasant views of the city, and features many Victorian-era style European edifices, a legacy its colonial past. Fujian’s cities boast beautifully-preserved colonial buildings on peaceful waterfronts, traditional mud dwellings, and many other cultural and religious sites such as bridges, temples and towers. Fujian is home to a multitude of minorities, with colourful customs and traditions. Never short on celebrations, this province proudly joins both nation-wide and culturally-specific festivals.